WASHINGTON, D.C. -- As Egyptians headed to the polls Tuesday for the first time since President Mohamed Morsi's removal, Gallup data collected just before he was deposed highlight the factors that contributed to Egyptians' precipitous disillusionment with his presidency. Most notable among all underpinning factors is Egyptians' confidence in the honesty of the election process itself. In June 2013, those with confidence in the electoral process were nearly seven times more likely to approve of the country's leadership than those who said they had no confidence in the honesty of elections. Egyptians' confidence in the electoral process, which had peaked at 89% in 2012, dropped to 34% days before Morsi's ouster. Economic perceptions also played an important role in leadership approval. In June, those who told Gallup they felt the economy was "getting better" or "staying the same" were more than three times as likely as those who said it was "getting worse" to approve of Egypt's leadership. Additionally, those who said they were living comfortably on their present household income were more than twice as likely to approve of Egypt's leadership as those who said they were not living comfortably. Egyptians' perceptions of freedom in their society are also strongly related to their likelihood to approve of their country's leadership. Those who said they were satisfied with their freedom to choose what they do with their lives and those who described the media in their country as having a lot of freedom were both nearly two times as likely as those who did not say this to approve of Egypt's leadership. 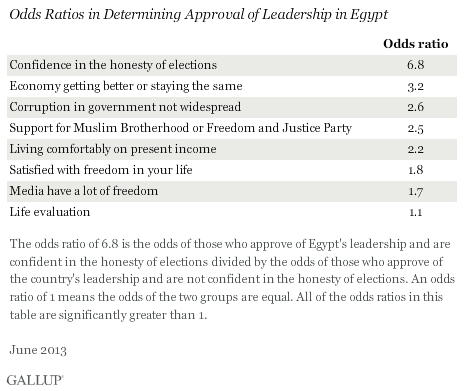 Finally, Egyptians who evaluated their lives more highly were also more likely to approve of their country's leadership. Life Evaluations and the Islamist "Bump"
There is also a relationship between Egyptians' life evaluations and their likelihood to support the Muslim Brotherhood or Freedom and Justice Party (FJP). Gallup began measuring support for both groups in late July 2011. At that time, 26% of Egyptians indicated they supported both organizations; their average life rating was 3.9 on a ladder scale of zero to 10, with no statistical difference between those who supported or did not support either or both organizations. By September 2011, Egyptians' average life ratings increased significantly to 4.3, while the proportion supporting either the Muslim Brotherhood or FJP started its upward rise to 32%. The percentage of those supporting either organization peaked at 75% in February 2012, just weeks after the parliamentary election. By June 2013, support had dropped by about 50% and average life ratings had dropped from 4.1 to 3.6, the lowest they had been since Gallup began measuring support for either group. In an April 2012 survey, the percentage of Egyptians who supported either the Muslim Brotherhood or FJP fell significantly to 51% and eventually made its way down to 23% in June 2013. This precipitous decline paved the way for Morsi's removal from office. The 2013 survey put Egyptians' average life ratings at 3.6 -- a two-year low. As in 2012, life ratings in 2013 were significantly lower among those who did not support the Muslim Brotherhood or FJP than among supporters of either organization. However, since the percentage supporting either party fell sharply in the interim, life evaluations declined among the overall population. The Gallup data suggest that Egyptians' support for the country's leadership during Morsi's tenure reflected their support, or lack thereof, for the FJP or the Muslim Brotherhood. Those who supported either group were twice as likely as those who did not support either group to say they supported the country's leadership overall. Other factors such as declining confidence in the electoral process may have figured more prominently into Egyptians' assessments of their country's leadership. As the first major component of the military-backed "roadmap," Egyptians voted for the second time in 13 months on a constitutional referendum. As presidential and parliamentary elections follow, those competing for power in the country should be aware that public support for the country's leadership has not been related to political popularity alone. Regardless of who leads Egypt moving forward, Egyptians are looking for leaders capable of instilling confidence in various economic and governance issues. Gallup data show that confidence in the transparency of the electoral process was the strongest factor underpinning approval of the country's last democratically elected leader. All parties vying for leadership have an incentive to bolster public confidence in the electoral contests that will bring them to power. Results are based on face-to-face interviews with 1,149 adults, aged 15 and older, conducted in June 12-19, 2013, in Egypt. For results based on the total sample of national adults, one can say with 95% confidence that the maximum margin of sampling error is ±3.3 percentage points. The margin of error reflects the influence of data weighting. In addition to sampling error, question wording and practical difficulties in conducting surveys can introduce error or bias into the findings of public opinion polls. Gallup reviews its top world news findings of 2013 based on surveys conducted in more than 140 countries through the Gallup World Poll.